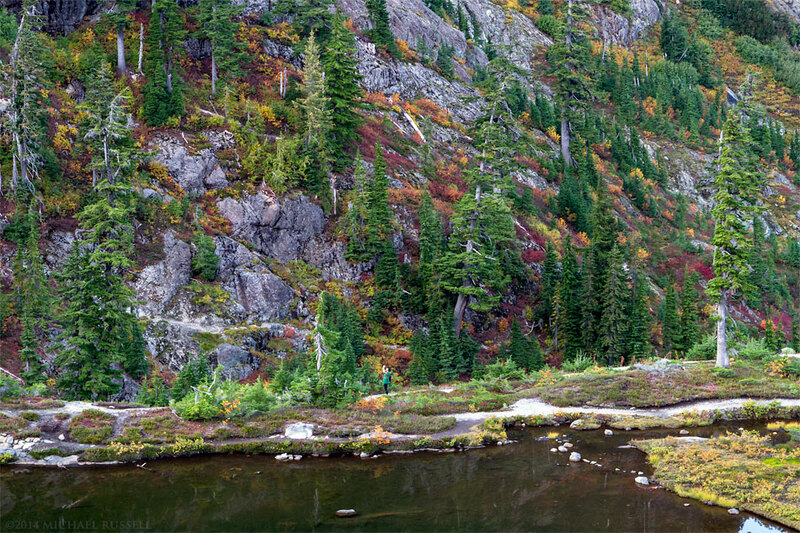 During my recent trip to the Mount Baker-Snoqualmie National Forest in Washington State, I photographed a variety of scenes around Picture Lake, Heather Meadows and Artist Point/Kulshan Ridge. In my previous post I showed a few of the photographs from the Heather Meadows area that included peaks of the North Cascades. In this post I have a few more images of fall foliage colors from Heather Meadows, but these scenes are not as wide in scope and in the case of the first image here (my favourite), a bit abstract. 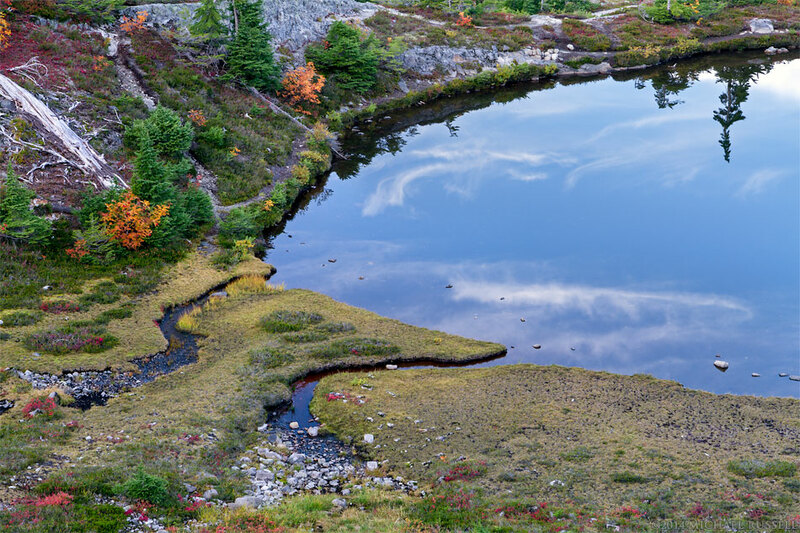 I think the above photograph of Austin Pass Lake is my favourite of these four images. I had already photographed a wider view of the the area and then tried to isolate the details at this end of the lake. I liked how the clouds looked a bit like they were flowing from the inlet out into the lake. A similar angle on Austin Pass Lake to the first photograph but this time with the reflection of Mount Herman. Can you spot the hiker/photographer in this photograph? I don’t photograph all that many people but when someone stands still in a place like this it is a good way to show the scale of the scene. Reminds me a bit of my photograph of Silver Falls in Mount Rainier National Park where someone standing in the scene really gave an indication of its scale. 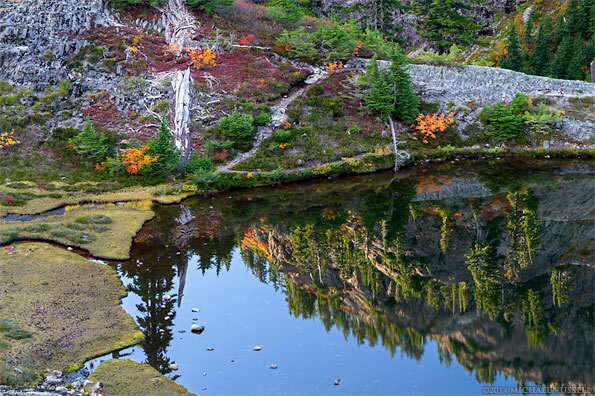 I liked the fall foliage colors in this landscape around Terminal Pass Lake in Heather Meadows (below Table Mountain). Everything here almost seems to be going westward (to the right). The water looks to be flowing into the lake, and the rocks look a bit like they are flowing down the talus slopes. The trail (the Fire and Ice Trail I believe) is leading you in that direction as well. 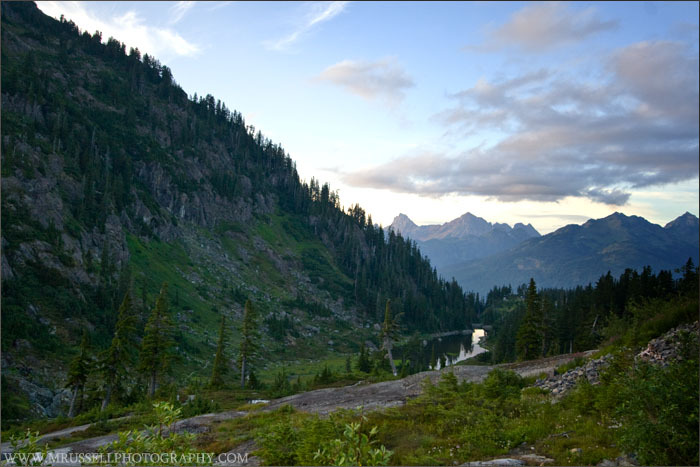 You can view more of my photography from this and surrounding areas in my Mount Baker-Snoqualmie National Forest Gallery. Bagley Lakes and Austin Pass Lake (right) near the Bagley Lakes trail at the Mt. Baker Ski area. 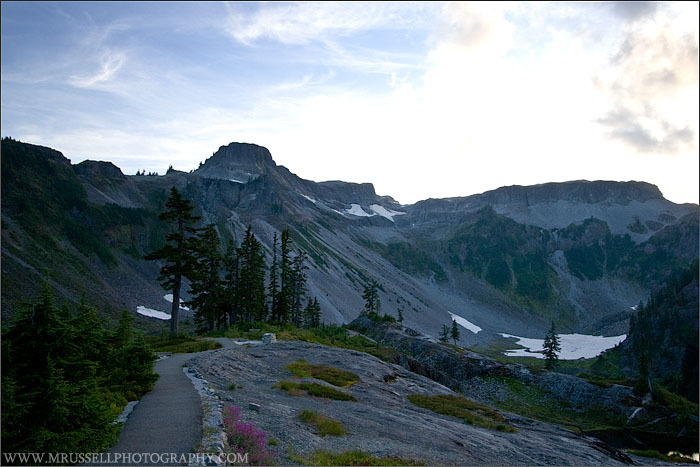 Tabletop Mountain is on the left in the first image. 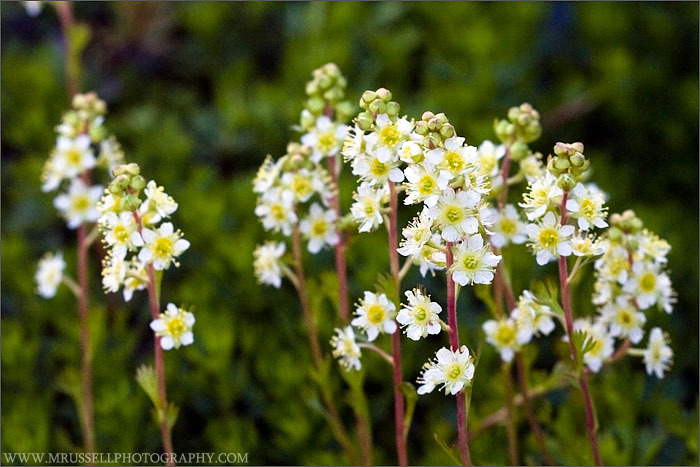 Wildflower below is Tolmie’s Saxifrage ( Saxifraga tolmiei ).